Jane - Sierra Vista AZ Women's 44 vest runs EXTREMELY small "The vest is nicely made, however, I chatted online to find out the length of the vest prior to ordering. I was told they could not give me any measurements. This was not helpful, but I decided to give it a try because the side gussets and the concealed carry pockets was what I was looking for - also it looked like it might be a longer style. I am 5'7" and normally take a 1X. I ordered a 2X just in case it ran small and also so that I could wear a sweatshirt underneath if I wanted to. 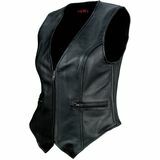 When I received the vest I couldn't even zip it up. I measured it against my current vest that I have and it was 6 inches smaller around. 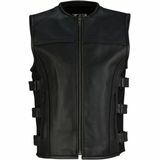 I also compared it against the size chart on the website and the vest is probably a size medium, not a 2X. So although it is a nice style, I would say it runs about 3-4 sizes smaller than listed. Sadly, I must return the vest."